The legal fraternity will all be affected in a number of ways when the remaining chapters of the Legal Practice Act (LPA) are implemented in the next few months. The implementation of the remaining chapters of the Legal Practice Act No. 28 of 2014 is scheduled for 1 November 2018 and affects all Legal Practitioners, which includes attorneys and advocates. The Attorneys Fidelity Fund, established in 1941 and which exists to protect the public against loss as a result of theft or trust funds by legal practitioners, will from this date be called the Legal Practitioners Fidelity Fund (the “Fund”) under the LPA. The changes that will have the most significant impact on the business of legal firms pertain to the collection and payment of interest earned on trust accounts. In accordance with the LPA, the four Law Societies – the Cape Law Society, the KwaZulu-Natal Law Society, the Law Society of the Free State and the Law society of the Northern Provinces – will be dissolved and replaced by one Legal Practice Council in each province. The Legal Practice Council was established as a single unified statutory body to regulate the legal profession. One of the main sources of income for the Fund is interest earned on trust accounts, although the LPA does not provide for the Legal Practice Council or its substructures to be involved in the collection of interest. The Fund is therefore empowered to collect its own trust interest. Every legal practitioner, with certain exceptions, must operate a trust account where a client’s money is deposited. These trust accounts must be at a bank with which the Fund has made an arrangement in terms of section 63(1)(g) of the LPA. The Fund is currently making arrangements with Absa, FNB, Grindrod Bank, HBZ Bank, Investec Bank, Mercantile Bank, Nedbank and Standard Bank and therefore legal practitioners should ensure that their trust accounts are in compliance. Another important upcoming change is that net trust interest that is currently being paid to the Law Societies, as a collecting agent for the Fund, vests in the Fund and must be paid directly to the Fund. The trust interest earned continues to vest in the Fund and 100% of this interest, less the approved recoverable bank charges, must be paid over by the bank on a monthly basis to the Fund. A trust account practice may, of its own accord, invest any money that is not immediately required for any particular purpose in a separate trust savings account or other interest-bearing account. This trust account must be also be opened with a bank that the Fund has made an arrangement with. The interest also vests in the Fund and 100% of this interest must be paid to the Fund on an annual basis. A trust account practice may also, on the instructions of any person, open a separate trust savings account or other interest-bearing account for the purpose of investing any money deposited in the trust account of that practice. These trust accounts must also be opened with a bank that the Fund has made an arrangement with. These accounts would be opened and conducted on behalf of someone who the practice exercises exclusive control over as trustee, agent or stakeholder or in any other fiduciary capacity. From 1 March 2019, 5% of the interest earned on these accounts will automatically be paid to the Fund by the banks, which the Fund has an arrangement with, on a monthly basis. Banks will communicate directly with their legal practitioner clients on how they will account for and report on the 5% interest that will be paid to the Fund. Banks will be required by the South African Revenue Services (SARS) to issue an IT3b tax certificate to the legal practitioner or the legal practitioner’s client for the 95% interest earned on any separate trust savings or other interest-bearing account. The banks will also issue an IT3b to the Fund for the 5% interest earned on these accounts. 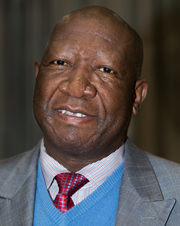 Motlatsi completed his law studies at the University of Limpopo, then known as the University of the North in 1984. He was admitted to practice as an Attorney on the 4th of August 1987 following a two (2) year period of articles of clerkship that commenced in June 1985. He holds a Management Development Program Certificate from Wits Business School and a Master of Business Administration degree from Regenesys Business School in South Africa. He has held several senior management positions amongst which is serving as Principal Attorney in Legal Aid South Africa, serving as Municipal Manager within local government in South Africa as well as serving as a Legal, Risk and Compliance Executive at Creditworx, a subsidiary of Thebe Investment Corporation. He was appointed as the Attorneys Fidelity Fund Executive Director Designate on the 1st of June 2011. His designation changed to Executive Director on the 1st of November 2011 and was later changed to Chief Executive Officer a position he holds to date.